With a stay at Red Roof Inn Mt Laurel in Mount Laurel, you'll be within a 15-minute drive of Cherry Hill Mall and Garden State Discovery Museum. This hotel is 11.8 mi (19 km) from Pennsylvania Convention Center and 11.8 mi (19.1 km) from Reading Terminal Market. With a stay at Wyndham Philadelphia-Mount Laurel in Mount Laurel, you'll be in the business district, within a 15-minute drive of Cherry Hill Mall and Garden State Discovery Museum. This hotel is 12.1 mi (19.5 km) from Pennsylvania Convention Center and 12.2 mi (19.6 km) from Reading Terminal Market. Located in Mount Laurel, Residence Inn by Marriott Mt. Laurel at Bishop's Gate is a 3-minute drive from Funplex and 7 minutes from Children's Hospital of Philadelphia Mount Laurel. 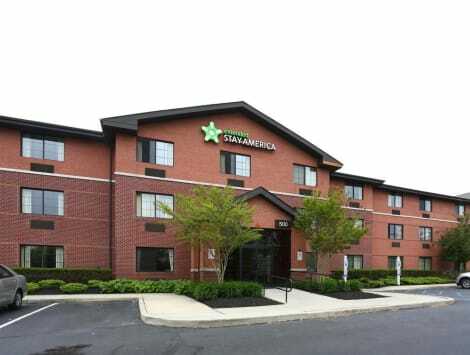 This aparthotel is 8.7 mi (14 km) from Cherry Hill Mall and 12.4 mi (20 km) from Sahara Sam's Indoor Water Fun Park. lastminute.com has a fantastic range of hotels in Mount Laurel, with everything from cheap hotels to luxurious five star accommodation available. We like to live up to our last minute name so remember you can book any one of our excellent Mount Laurel hotels up until midnight and stay the same night.